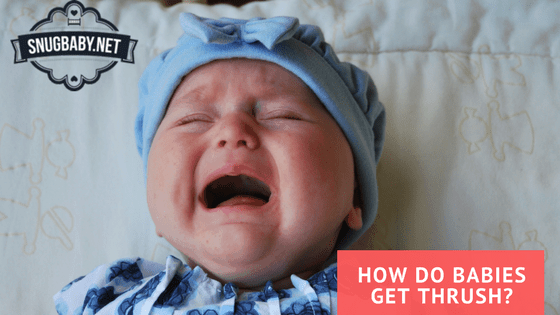 →How Do Babies Get Thrush And How Is It Treated? How do babies get Thrush? If you are a new parent then that’s a question you may be facing. The good news is that while it may sound like a frightening medical condition, the truth is that it is treatable by a doctor and generally not something to be overly worried about. As a parent, there are so many different things you need to watch for and be concerned about, and Thrush is just another thing on that long list. Part of what makes being a parent to a baby so challenging is that a baby can’t tell you what is wrong. Your baby will tell you something is wrong with their behavior, which often includes crying. What you need to be able to do as a parent then is to watch their behavior, then do some detective work to determine what is wrong with your baby. Thrush is a fungal infection that often forms in the mouth of babies. When a baby has Thrush they will often have symptoms that can be recognized if you know what you are looking for. The most common sign of Thrush is small white or yellow patches that appear in your baby’s mouth. These patches can cover the roof of the mouth, the gums, the tonsils, and even the throat of your baby. One of the first signs that your baby may be suffering from Thrush is if they seem uninterested in a bottle. The white and yellow patches that are caused by Thrush can be quite painful, so if a baby has it they are often not as willing as normal to accept a bottle. If you notice this or have seen any signs of patches in your baby’s mouth, then you need to open up his or her mouth and take a look. If you see signs of Thrush, then it’s time to take your baby to their pediatrician. Thrush is what is known as an opportunistic infection. It’s caused by an overgrowth of a specific type of fungus in the mouth. While it may not be fun to think about, the truth is that we are all covered in all kinds of bacteria, fungi, and various other types of microorganisms. In normal circumstances, our immune system will keep these microbes in check. But, when it comes to your baby their immune system is much more vulnerable than the immune system of a typical, healthy, adult. Without a properly developed immune system, some of the microbes on our bodies can begin to grow at a level that is not healthy, which is exactly what happens when a baby gets Thrush. The good news here is that Thrush is very rarely a serious concern. Unless the case is severe and long-lasting, it generally only causes mild discomfort until it clears up. The easiest way to see if your baby has Thrush is to look inside of their mouth and see if there are any of the white or yellow patches on the inside of their mouth. Another thing to look for is to see if the tissue under the patches appears to be red and irritated. If you still aren’t certain if your baby has Thrush then you can always take him or her to their pediatrician. Your baby’s pediatrician can usually diagnose Thrush through a simple examination. If for any reason they are not certain if your baby has Thrush or some other medical condition, then they may do a small scraping to test the spots for Thrush. This may sound a little frightening, but the reality is that it is a simple and painless procedure. In the majority of cases treatment for Thrush isn’t really necessary. Given enough time your baby’s immune system should respond to the Thrush, and begin to fight it off. It’s important that you pay attention to your baby while you are waiting to see if his or her Thrush is improving. You need to look inside his or her mouth on a regular basis to see if the spots are getting bigger, smaller, or more numerous. By paying attention to how the condition is progressing you can ensure that you aren’t waiting too long to take your baby to their pediatrician. If your baby’s pediatrician decides that treatment is necessary to clear up the infection, they will usually prescribe Nystatin drops, which are an anti-fungal medication. Make sure that you follow the pediatrician’s instructions carefully, and that you give the medication exactly as you are told to do. While Nystatin drops are generally very safe to use, you should make sure to pay attention to any signs of distress that your baby may experience in case they end up having an allergic reaction to the medication. Allergic reactions to this medication are rare, but as a parent, you should always be on the lookout for anything that could be harmful to your child. If your baby is prescribed medication for their Thrush infection then it’s important that you also monitor your child to see if he or she is improving with treatment. After a few days, your baby should so significant improvement, if not then you need to contact your pediatrician to schedule a follow-up appointment. Important: If you’re still breastfeeding, your Doctor will probably want to treat you as well – so you and the baby aren’t passing the infection back and forth. If you notice white or yellow spots in your baby’s mouth then your first inclination may be to panic. That’s totally understandable since most parents want nothing more than to ensure that their baby is happy and healthy. The good news is that if your baby does have Thrush, you probably have little to worry about. This minor fungal infection should clear up on its own within a few weeks, and if it doesn’t then it is easily treated by a doctor in most cases. Just make sure that you pay attention to your baby to see if he or she is exhibiting any more serious issues, if not then you can usually count on your baby bouncing back from this minor problem in a short period of time. Let us know below – we’re here to share, and open up our comment section to other parents!